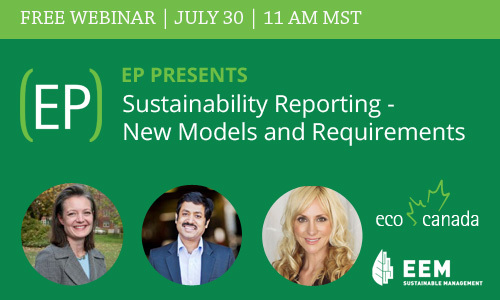 Stephanie Hamilton, Vice-President of Sustainable Business at EEM, will share her expertise on Sustainability Reporting in an Eco Canada live webinar on July 30, 2015 at 1:00 pm EST. The webinar is primarily hosted for the organization’s members by Eco Canada certified Environmental Professionals, but is also open to public. Presented in English, this webinar is an opportunity to learn about current best practice and emerging drivers. Missed the webinar? To listen to the recording with slides, click here.